Apple’s solution to these problems was the creation of Newsstand and making some tweaks in iOS and adding APIs for developers to take advantage of. 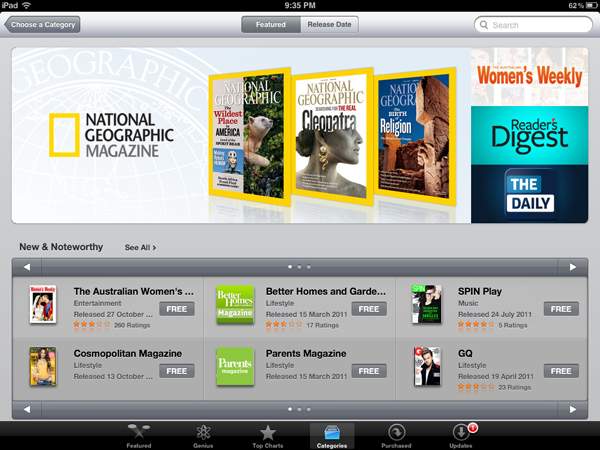 With iOS 5, developers can create their app to be a special Newsstand app. I won’t go into specific details, but it allows them access to some extra APIs that help improve the experience of magazines and newspapers on the iPad. Once a developer decides to call an app a Newsstand app, it gets automatically moved into the Newsstand folder - Newsstand apps cannot be moved outside of the folder. One of the benefits of declaring an app a Newsstand app is that it can get a special icon that doesn’t have to be a rounded rectangle. Instead the icons are slightly larger, can take the proportions of the physical copy, and (most importantly) can be dynamically updated with the front page/cover of the latest issue. A standard icon is still also required for some purposes (such as listing in the App Store, Spotlight and the Settings app), but on the home screen and in the multitasking tray you will see the dynamic icon. A nice touch is that when in the multitasking tray (when the icons are smaller), Apple adds adornments to the icon such as a ‘stack and fold’ for newspapers and a ‘staple and pages’ for magazines (see below to see what I mean). As explained, when an app is declared to be a Newsstand app, it automatically gets placed inside the Newsstand folder - and cannot be removed from it. I can see why Apple chose to do this, users can more easily find their magazines and newspapers, and the visual style of the Newsstand folder does stand out, particularly when filled with content. However, I am a little disappointed that there is no way to move a Newsstand app outside of the folder - for a user who only subscribes to one or two magazines or newspapers it might seem a little wasteful to have a dedicated folder that stores them. However, you are able manually adjust the ordering of the magazines and newspapers with the usual tap and hold method. A misconception of Newsstand that I initially had after the announcement at WWDC was that Newsstand would act as a store front (think iTunes or iBookstore) where individual issues or subscriptions could be purchased and then stored as individual issues inside the Newsstand. This is not how Newsstand works, those existing iPad magazines (such as Wired, Popular Science, National Geographic, etc.) and iPad newspapers (The New York Times, The Daily, etc.) work nearly identically as before. The difference is that they are stored inside Newsstand and have a few new abilities (such as the dynamic icon and background downloading as explained below). 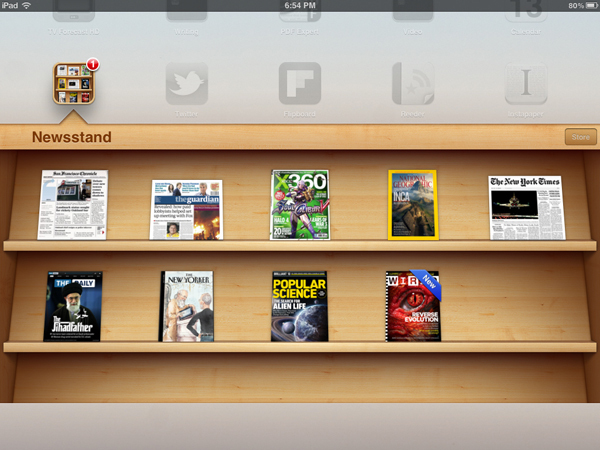 Newsstand is merely a new gateway to these publications. As explained, a big issue with publications such as Wired, Popular Science and The Daily was that before the latest issue of a publication could be read it had to be downloaded, leaving users to wait for it to be downloaded. Because Apple has severe restrictions on what an app can do in the background (virtually nothing), issues had to be downloaded with the app open. When a typical issue of Wired weighs in at over 500 MB, this was no quick task and it left users frustrated. Now with iOS 5, developers that are developing Newsstand apps can deliver a new “souped-up” push notification that informs their app (rather than the user as push notifications normally do), that a new issue is ready to be downloaded. When a Newsstand app receives such a notification, it can download in the background if the device is on WiFi. The main limitation here is that each app can only send 1 of these push notifications per day, so at the moment developers cannot develop newspapers that deliver both a morning edition and evening edition - although I suspect this might change eventually. Once the issue has been downloaded and is ready for consumption, the newspaper or magazine will receive a “NEW” sash over its icon (no number), whilst the Newsstand folder will display a number indicating how many new issues are unread inside the stand. As soon as you launch the app, the sash will disappear (regardless of how much you have read). To better integrate the experience of purchasing new magazines and newspapers, the Newsstand folder features a ‘Store’ button that opens the App Store. It opens up the new Newsstand category within the App Store, which contains all the apps that are Newsstand compatible - only apps that can do the new features described in prior sections will appear here. As publishers add Newsstand support for their apps, this category will become a great resource and less cluttered by the more broad ‘News’ section. This category is also available from within iTunes on the Mac or PC.